Recorded at Carriage House Studios, Stratosphere Sound, Shout It Out Loud Studios, Swan 7 + our bedrooms! Vocals by Michelle Morehead on Japan Air, Bianca Raquel on Prom Night and Eimear O'Donovan on Viridian Genesis. Mastered at Sterling Sound by Chris Gehringer. 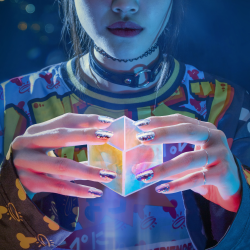 Art & Design by Andrew Strasser and Anamanaguchi. Special Thanks: Alon Shapiro, Leia Jospe, Tate Gregor, Gia Seo, Nathan Rithoiz, Baken and Josh, Jeff Donaldson, Mei, George Brower, Andrew Sarlo, KVX, the Illusion, chiptune, Blood Diamonds, APA Agency, Pitch Perfect PR, Primary Wave, + all our bffs and family!! In loving memory of Captain Don DeVito.